I’ve got 4 kids. The fact that I have one of those Toys R US wooden playgrounds taking up half my backyard should come as no surprise to anyone. Not only does it save me from having to go to the local park, but has the capability to become a pseudo tree fort or Ninjago Battle Front on any given day. But as my kids have grown, they became less interested in the same-old, same-old wooden playground, and I realized that unless I want to sell it and remove it from my backyard completely, I’m going to have to spice things up a bit. 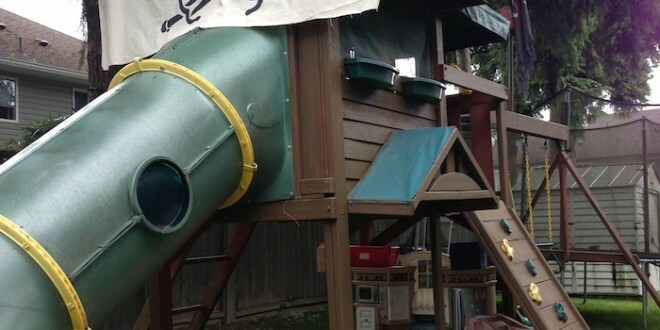 So I took my wooden playground and turned it into a DIY pirate ship playhouse. No, I didn’t spend a ton of money – the entire transformation came in under $50. Start with some paint – I had my kids out there with paint brushes touching the ‘ship’ up. After a few years outside in the sun, it was starting to flake paint in some areas. Head off to Michaels to buy a ‘crows nest’, flag pole, and pole to hold the sale – I had a 40% off coupon, so the apple basket I bought and the flag pole were around $10. Spray paint the crows nest and pole – I gave it two good coats to withstand the sun. Attach the crows nest to the pole – You can use short screws and a drill for this step. Be sure it’s on firmly. Find a pirate flag – Our local party store had a ton of different pirate flags. 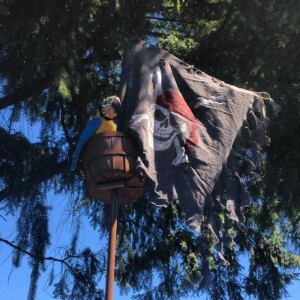 Attach the pirate flag to the pole above the crows nest. 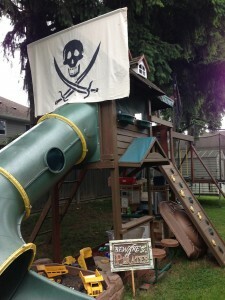 Attach pole with pirate flag and crows nest to the playground structure – Keep your drill handy to secure it firmly. Insert parrot – I had one of those ‘Squawky’ birds that talk hanging around. It’s pretty entertaining pressing his remote control and listening to him chatter and move. It’s even more entertaining doing it from around the corner while the neighbor peeks over your fence and is wondering where the squawking is coming from. Purchase large piece of burlap from fabric store – I spent about $10 on this. Paint large skull and cross bones on flag with black chalk paint – I had some laying around, but a small container is about $12. Fix the flag to the front of the playhouse. Buy a periscope and spy glass from a store like Walmart – Your playground might already come with one, but mine didn’t. I bought the two for around $15 . Put them anywhere in the tree fort part of your playhouse. 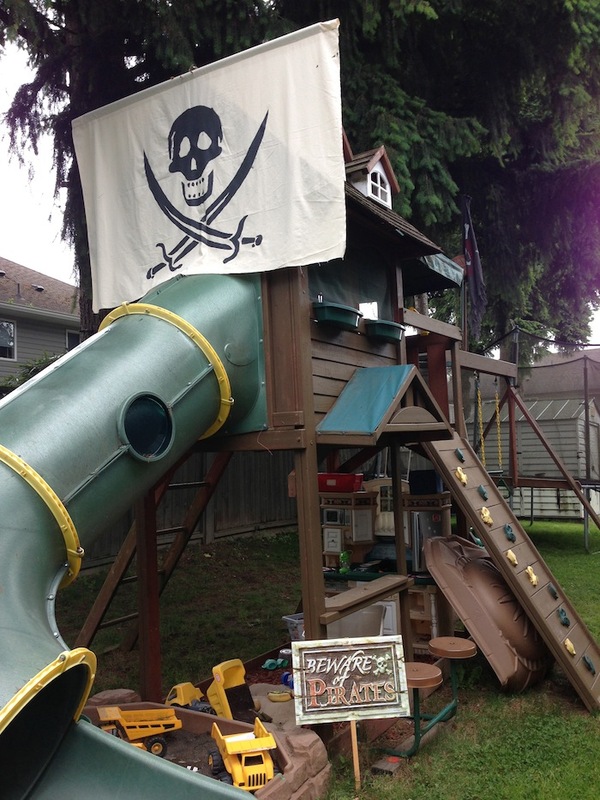 Yes, you can do it more expensively or you can buy yourself an actual pirate playhouse from somewhere, but if you want to give your little pirate enthusiast that pirate ship feel and you don’t want to spend a ton of money, re-doing your wooden playground is a great idea. Next Which apps are worth the money?